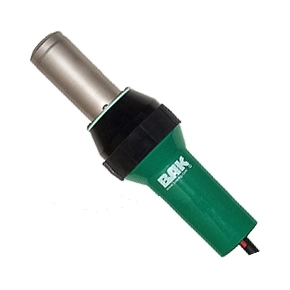 PRODUCT: BAK ERON 230V, 3400W, HAND HELD HOT-AIR WELDER (plug not included). A powerful hand-held hot air welder (very similar to the Electron hand welder). The BAK ERON welder is 230VAC 60 Hz, 3400 watts, and provides outstanding temperature control, ease of use using a step-less temperature from 20 to 650C and an air flow of 500L/minute. An adjustable temperature scale allows for exact selection of temperature to fit your application. * ELECTRON tips fit and other tips are available for many applications. * PLUG NOT INCLUDED. Needs 230V 15A, L630P or similar suggested. 50 Foot Long 10/3 SOW Grade Rubber Power Cord, with 30 Amp L6-30 Twist Lock Plug and Outlet (30A 3-wire, 2-pole @ 250V). Price/Each. BAK Replacement Carbon Brushes with Springs. For Eron / Laron Tools. Set of 2. Price/Set. BAK #5113269(type 32 / 113.269), 230V 3300-3400W REPLACEMENT HEATING ELEMENT. FITS 3-PRONG ERON, ELECTRON AND SIMILAR WELDERS. MADE IN SWITZERLAND. PRICE/EACH.